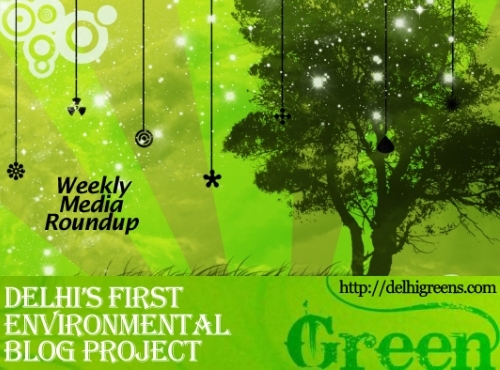 Weekly green news update from across different media networks for week 34 (between August 22 to 28) 2016. A desert bird, Stoliczka’s Bushchat or the Whitebrowed Bushchat, has been spotted in Delhi’s ornithological history for the first time. Feeding birds at traffic islands may be your way of seeking a staircase to heaven, but what you end up doing is ensuring the proliferation of blue rock pigeons to the detriment of other species, once common such as the house sparrow and the Brahminy mynah. The Yamuna river, often called Delhi’s lifeline, is gasping for life. The 22-km stretch along the national capital has virtually no aquatic life – thanks to over 20 drains that pour untreated sewage and other waste into the river. Rickshaw pullers and hawkers on Monday moved National Green Tribunal pleading that they be allowed to intervene in an application filed by petitioner Vardhaman Kaushik against severe air pollution in the city. The high court has asked the AAP government to give information about the number of trees that were felled for widening of the Mehrauli-Mahipalpur road in south Delhi. At least Rs 400 crore collected under the “polluter pays” principle in recent times and Rs 300 crore out of the entire pollution cess on diesel sold in the capital since 2008 are yet to be utilised to improve the air quality in the capital. Solid waste from Ghazipur landfill site in east Delhi would be used in the construction of Delhi-Meerut Expressway, a section of the NH-24, in a move aimed at curbing pollution in the city. The National Green Tribunal has directed State governments and Union Territories to fill within three months vacancies in their pollution control boards by appointing persons with requisite qualifications. Experts from various fields have urged people to plant more trees and adopt anti-pollution measures after a US embassy report said there was an increase in the concentration of air pollution in many cities, including Delhi, even during monsoon which is considered the best season in terms of air quality. While hundreds of crores have been spent on cleaning of rivers in the country, a new technology ‘Eco-Bio Block’ system claims to clean the river in a cost-effective manner using lesser manpower. The Manipur-based Institute of Bioresources and Sustainable Development, a national institute under the central government’s Department of Biotechnology, has been awarded the Global Sustainability Award at the Seventh World Renewable Energy Technology Congress here. The National Green Tribunal today recalled its earlier order of issuing bailable warrants against the resident commissioners of five states and one UT for not appearing before it during proceedings on protection of biodiversity. This is the sad saga of rhinoceros poaching in Kaziranga National Park which lies in the heart of Assam.